That was the responds two of fifty thousand housewives recently polled in an international survey. Yet, on the other hand, many fit the description of Julie, who is up every morning at dawn to begin a daily ritual of housecleaning. Everything in her house gleams. All her friends envy the way it looks. Quite a difference of attitude from those who ‘hated’ housework! Does either viewpoint prevail in your home? Certainly your attitude, or that of your mate, toward housework can have a direct bearing on your own comfort and happiness. But what is a realistic view of that which some consider a “curse” and others say is one of the “highest of feminine virtues”? A husband, just returning from a weekend business trip, could hardly believe his eyes. The kitchen looked like a disaster area—the stove covered with scorched pots and pans, the sink bulging with dirty dishes, the floor covered with grime and food waste. Beyond the kitchen, he saw the living room cluttered with newspapers, bottles and toys. His two little children were wrestling on top of a large pile of soiled laundry. And in the midst of all this chaos was his wife, calmly sitting in an easy chair, with her feet up on a table, leisurely reading. Who of us does not enjoy coming into a clean, calm, orderly home? On the other hand, dirt and grime can irritate. But really, isn’t it more important to be a companion to your husband and to keep up with what’s going on in the world than to spend your life as a ‘lowly house cleaner’? After all, to expect someone with brains to spend all her time doing housework is just not fair, others may think. However, to prevent housework from becoming a boring task that consumes all your time requires skill and initiative—no small requirement in this age of mental laziness. Some homemakers are able to think about other things while doing certain parts of their housework that may require little concentration. For instance, some mentally plan future meals, organize their day’s schedule or reflect on family vacation plans. Why do some women consider housework an important, dignified service? They view their housework as a “labor of love” for their family. Also, there is contentment in seeing a job well done. “I don’t know anyone who finds housework absorbing, fulfilling, challenging. However, like death and taxes, there it is,”. Coupled with the “feeling of accomplishment” is a clear conscience, not always having to apologize for the condition of the home, and a sense of self-respect. But what about persons like Julie, who must have a perfectly immaculate home? Who said people have to eat off the floor? Additionally, some women have been raised to view housework as one of the highest feminine virtues. These are obsessed with keeping an immaculate home—regardless of how much time it takes. Naturally this comment should not be taken as a reason to excuse a housewife from being diligent to keep her home clean, but never forget why you do it—to make your family comfortable. So do not steal their peacefulness by being overly fussy. Which should come first—the house or those who live in it? Are your own standards so high that others feel uncomfortable? You will never get all the housework done. So decide how much time you will devote to it. Then diligently do as much as your own pace allows. 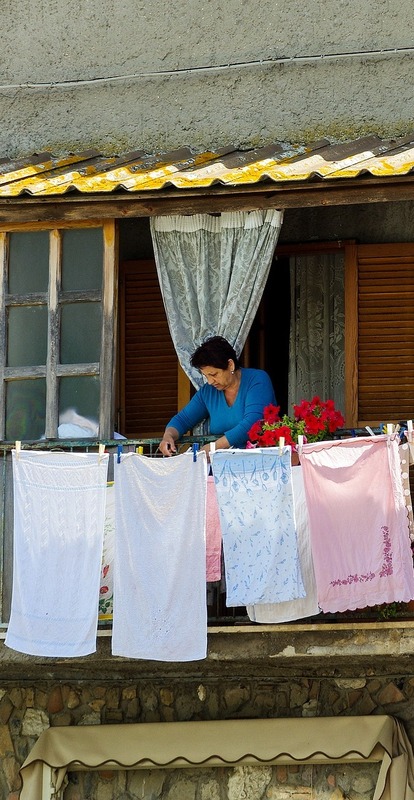 Reportedly, some women spend on the average as little as an hour a day straightening up their homes. Others may spend longer, depending on their family’s living habits, their own abilities, strength and circumstances. However, some other homemakers struggle against another real weakness in the human makeup—laziness. This can color one’s attitude about housework. The excuses of a lazy person are well known. She echoes the plight of an increasing number of women. However, when the wife works outside the home a number of hours similar to the workday of the husband, there is a real need for understanding and help from the rest of the family. The children also can, and should, help. Especially so if theirs is a single parent who must work full time. Every day my husband scours the bathtub after his shower. After dinner, he cleans and scrapes the dishes, while I wash the stove, counters and put away leftovers. . . . Three nights ago my husband ironed while I prepared the dinner. We were able to talk about our day while we completed these tasks. . . . We often share cooking and make it fun—drink a glass of wine and talk. If I had to do housework alone, I’m sure I would consider it drudgery. Proper balance creates a clean-as-I-can-make-it home, but with a relaxed atmosphere prevailing inside. So keep housework in its proper place—not first, and not last either.